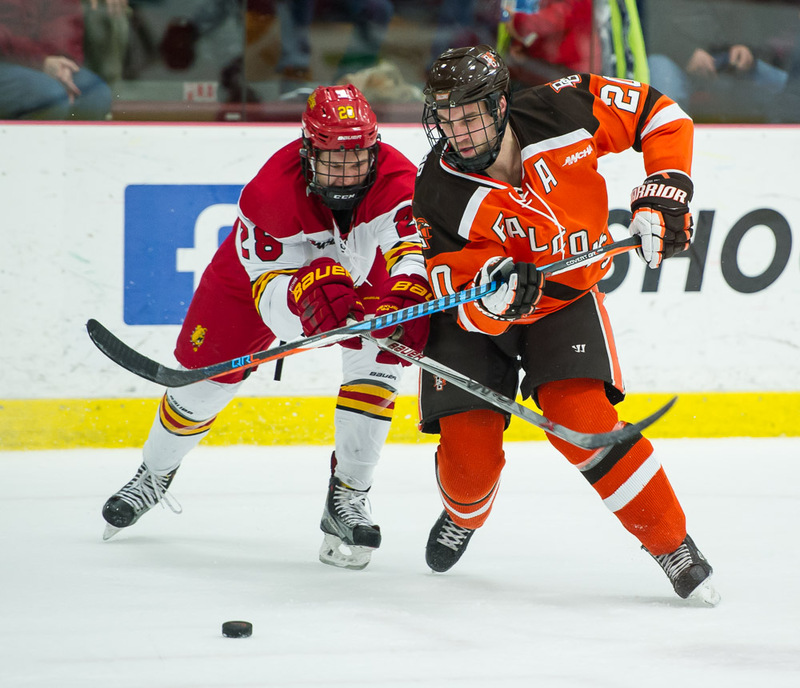 Bowling Green's Matt Pohkamp (right) battles Ferris State's Jacob Hetz during Saturday's game (Photo by Todd Pavlack/BGSUHockey.com). BIG RAPIDS, Michigan — Chris Nell’s excellent goaltending was all Bowling Green had to offer Saturday night. His teammates took the night off. The Falcons barely competed, showed little intensity and executed poorly en route to a 5-0 loss to Ferris State in a Western Collegiate Hockey Association game. Nell’s 30 saves — including 17 during a scoreless first period — enabled the Falcons to keep the final score mildly respectable well into the second period. Ferris was sharp from start to finish, and finally broke open a scoreless game with a four-goal second period. The Falcons played one of their worst, if not the worst, games of the season. BG was bidding for a sweep of the series after it posted a 3-2 overtime win Friday. Instead, the team hit another low point in its season of underachieving. After finishing first in the WCHA coaches and media polls, BG fell to 14-15-2 overall and 12-11-1. Minnesota State moved one point ahead of the Falcons for third place in the WCHA. The Mavericks also have two games in hand on the Falcons. “It was a no-show tonight except for Chris Nell,” BG coach Chris Bergeron said. Ferris frequently tested Nell, and eventually solved the junior in the second period. The Bulldogs’ goals were scored by Jason Tackett at 2:51, Mitch Maloney at 8:59, Chad McDonald at 18:24 and Gerald Mayhew at 19:31. Ferris’ Jared VanWormer closed out the scoring at 12:14 of the third period. Bergeron gave no thought to pulling Nell when the game was out of hand in favor of freshman Ryan Bednard, who was late for a team meeting earlier Saturday. Nell also played well in the series opener, stopping 21 shots. “I didn’t want to pull (Nell) because Bednard didn’t deserve to go in,” Bergeron said. THE VIEW FROM FERRIS: Eleven different Bulldogs at had at least one point in the game, including five different goal-scorers. Mayhew and Maloney each had one goal and one assist, and Justin Kappelmaster made 19 saves. Although Ferris finished the game with a 35-19 advantage in shots, the margin was 32-11 through two periods. The goals were the result of good plays by Ferris and mistakes by the Falcons. The Bulldogs (9-16-4, 8-11-3-2) and Lake Superior are tied for fifth in the league with 29 points — nine behind BG, but only two ahead of seventh-place Alaska. Alaska has four games in hand on BG, and Ferris and Lake Superior both have two. Kappelmaster posted his second shutout of the season. The freshman ranks second nationally with a .941 save percentage and eighth with a 1.99 goals-against average. Ferris is 7-5 against the top four teams in the WCHA, but it’s 1-6-3 against the rest of the league. MORE NELL: After the 17-save first period, Nell added 11 saves in the second period and two saves in the third period. Nell has played well in all seven of his starts since returning from the Christmas break. He entered Saturday with a 1.64 goals-against and a .940 save percentage in the first six of those games. PK: The Falcon penalty-killing was perfect for the fourth straight game as it didn’t allow a power-play goal in four attempts. One of the kills was a 5-on-3 for 1:06 in the first period. Ferris had just six shots in 6:54 with the extra man. The BG penalty-killing was 10 of 10 in the series, and hasn’t allowed a goal in its last 19 short-handed situations. BAROMETER: One indication of how bad the Falcons were Saturday is they had just one power-play attempt, that coming with 11:37 remaining in the game. BG had the puck for so little time and generated little sustained pressure offensively. The Falcons’ 164 power-play attempts this season are second-most in the nation. Quinnipiac is first with 179. “Tonight we only drew one penalty, which is a good indicator that we weren’t close to our best,” Bergeron said. BG had just one shot on that power play. PENALTIES: The Falcons have been taking too many penalties of late, but they had just six penalties Saturday. Two of the penalties were part of matching minors with a Ferris, leaving neither team short-handed. But Bergeron was upset one of BG’s penalties was for too many men on the ice. That penalty gave Ferris a two-man advantage. SWEEPLESS LATELY: The Falcons failed to put together another good weekend. They’ve split six of their last seven league series, and were swept in the other. BG’s last sweep came Nov. 17-18 at Alabama-Huntsville, although it earned a win and a tie against Alaska-Anchorage at home Nov. 24-25. The Falcons’ only other sweep this season came at Northern Michigan Nov. 10-11. TIDBITS: Sixteen of the Falcons’ 18 non-goalies were on the ice for at least one Ferris goal. The exceptions were defenseman Chris Pohlkamp and Frederic Letourneau. Defensemen Mark Friedman and Alec Rauhauser were both -3, while defenseman Connor McDonald, and forwards Tyler Spezia, Kevin Dufour and John Schilling all were -2. Ferris’ 35 shots were just one shy of the season allowed by the Falcons, who gave up 36 shots against Michigan Tech Dec. 10. The Falcons’ 19 shots were their lowest of the season after they had 20 at Western Michigan Oct. 15. They also were shut out for the first time this season. 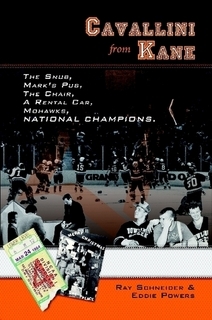 Lake Superior was the last team to shut out BG, posting a 1-0 overtime win in Sault Ste. Marie, Michigan Jan. 9, 2016. LINEUP: McDonald returned to the lineup after missing Friday’s game with an upper-body injury suffered Jan. 21. But defenseman Adam Smith (hand) remained out. McDonald replaced defenseman Niko Coffman in the lineup, while forward Casey Linkenheld replaced forward Jakob Reichert. NEXT: The Falcons host NMU next weekend in another league series. The Wildcats were idle over the weekend, but are 3-0-2 overall and in the WCHA during January. NMU (7-17-4, 5-12-3-1) is tied with Alaska-Anchorage for last place in the WCHA, five points behind UAH for the final playoff spot. NMU and UAA both have played two fewer games than UAH. The Wildcats were fifth in the WCHA coaches and media polls. WHAT’S LEFT: The Ferris series marked BG’s final regular-season road games. The Falcons play their final five games at home. They also host Mercyhurst Feb. 11 in a nonleague game and finish the regular season against UAH Feb. 24-25. BG is off the weekend of Feb. 17-18.